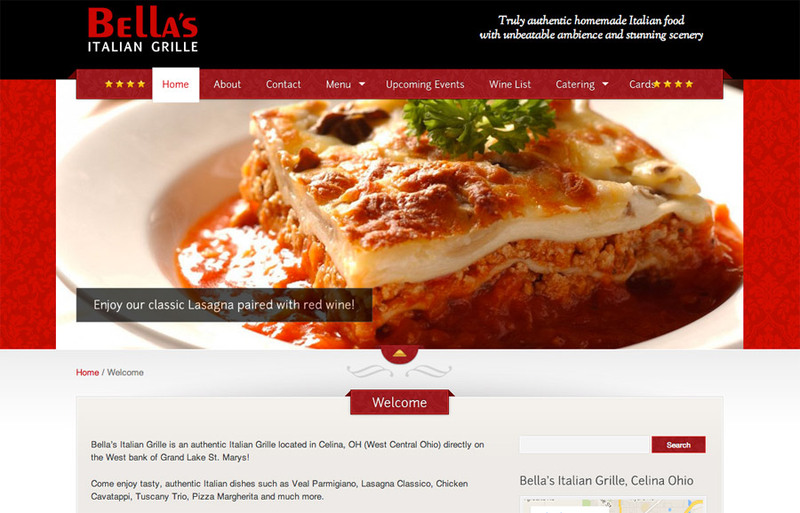 Bella’s Italian Grille is one of the finest authentic Italian restaurants in Ohio. You can enjoy amazing, mouth-watering cuisine while sitting on the bank of beautiful Grand Lake. The picturesque view of the lake and spillway add to the already warm and welcoming ambience. Webcore wanted to make a website that reflected that warmth and beauty. The menu was another problem to tackle. Most restaurants don’t have a great menu available on their website. This is a growing problem, as most people want to view the menu on their phone. A lot of the time you’re on the go and need to see what the restaurant has to offer from your vehicle. Many restaurants turn to a PDF file or other graphic format. That’s ok and it works, but when you change your menu it’s not easy to update – plus it doesn’t scale well to a phone or tablet. You have to pinch and zoom with your fingers and that’s generally kind of a pain. So we developed a WordPress site that incorporated the menu as the main form of content. The menu is searchable and it can be presented in different ways (for instance as a vegetarian menu, or just the pasta menu items). The menu is mobile responsive like the rest of the website, so that’s a win too. It’s easy for Bella’s staff to add or edit menu items as well, including adding photos to give customer a better idea what that item looks like. It’s nice when you can create a website you’re proud to show off and we’re certainly proud of this one. So if you’re ever in the Celina area and hungry at the same time, check out Bella’s for some great Italian food. We’re sure you’ll be happy you did!